On this memorable day trip through the Cascade Mountains, you will see beautiful mountain landscapes, waterfalls, and travel along white-water rivers. This is a mountain loop tour, traveling over 3 mountain passes: Stevens Pass, Blewett Pass and Snoqualmie Pass. See Bridal Veil Falls, where Big Foot has been spotted! plus Deception Falls, and Snoqualmie Falls. 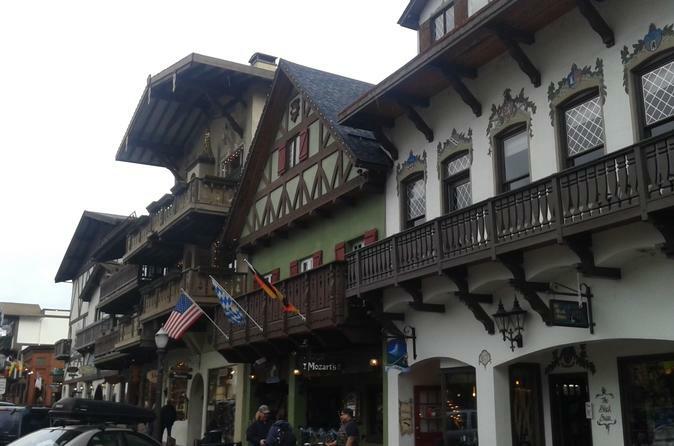 Leavenworth is fantastic, a Bavarian Alpine Village with character of its own. A beautiful small town, you'll have time to shop the many small businesses and eat a delicious meal in one of the many restaurants. From Bavarian food to Mexican, there are many choices. Tour group will be between 2-5, and you'll travel in our comfortable SUV. From your hotel, B&B, Airport or Pier, you'll head East on your tour, past animal and agricultural farms and through old mining towns on your way through the Cascade Mountains. First, you’ll see Snoqualmie Falls, about 45 minutes outside Seattle. The Falls are 268 feet tall and regardless on the time of year you'll see a beautiful. There’s a gift shop if you wish to explore local items. Then you’ll travel over Snoqualmie Pass and Blewett Pass to Leavenworth. As needed you can stop to stretch your legs on this 2 hour drive, to stretch or grab a snack or coffee. Next stop is lunch in Leavenworth (own expense), a Bavarian wonderland of its own, with time to explore the river walk and the town. There are many many restaurants to choose from, some with Schnitzel, some with Bratwurst, or go with Italian, Mongolian Grill, or Mexican. The town will entrance you; so like Bavaria (Germany/Switzerland). Tumwater canyon is beautiful as you continue along the Wenatchee river after lunch, with many whitewater sections and an historic dam. Stevens Pass has a ski resort which has no snow in summer, and if you’re a hiker, you should know the Pacific Crest Trail crosses here. Learn history of the natives and the settlers as the railroad was brought west. You'll see the Skykomish River and 2 very different waterfalls, Bridal Veil across the valley, and Deception Falls, where you'll have a chance to walk an easy trail to experience this amazing river and creek. Maybe see a Sasquatch at the Big Foot Coffee shop before returning to your hotel/airport location.